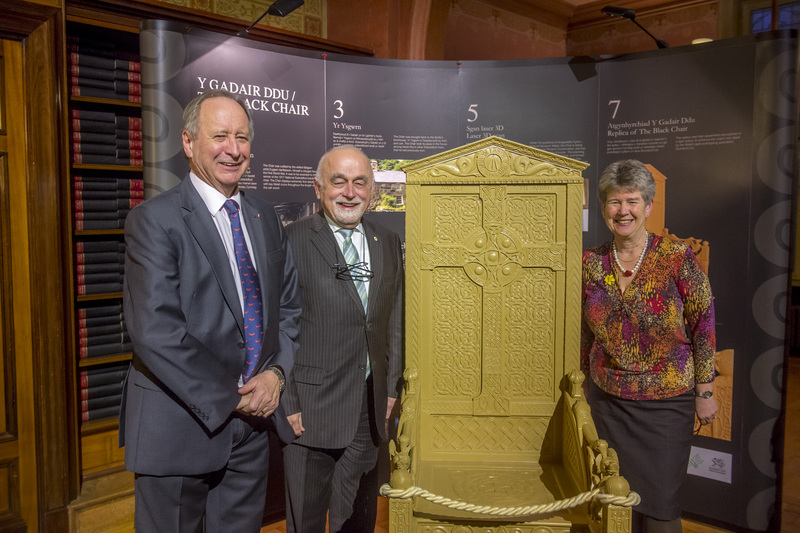 On 2 March 2016, the replica Y Gadair Ddu (The Black Chair) was the centrepiece at the annual Welsh Government St David’s Day event in Brussels. The event provided a great platform to showcase Wales and Welsh produce. Over 300 people attended including the Welsh Government’s Minister for Finance and Government Business, Jane Hutt AM, Members of the European Parliament and personnel with links to culture and economy in Wales and beyond. The following day (3 March) the replica Chair moved to the Flemish Parliament, at an event they kindly organised to welcome the replica’s arrival and which was hosted by the Speaker of the Flemish Parliament, Jan Peumans. It brought together attendees from various nations, including the British Ambassador to Belgium, to remember the links between Wales and Flanders, in particular those relating to the First World War. The reception was also attended by the Mayor of Sint-Niklaas Mr Lieven Dehandschutter who addressed guests in Welsh and Dutch, sharing the story of Hedd Wyn and the Welsh link with Flanders. Visitors had the opportunity to see at close quarters the striking 6ft replica of Hedd Wyn’s original Gadair Ddu, created using pioneering 3D printing technology in Wales, which was unveiled by Carwyn Jones AM, First Minister of Wales, at the Senedd in Cardiff on 13 January 2015. 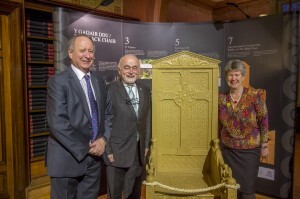 The chair was created in partnership between the Welsh Government, Snowdonia National Park Authority, Cardiff University and Amgueddfa Cymru – National Museum Wales. Hedd Wyn was posthumously awarded the chair for his poem Yr Arwr (The Hero) at the National Eisteddfod in Birkenhead in 1917, six weeks after he died during the Battle of Pilkem Ridge in Flanders in July of that year. The chair was famously draped in black during the chairing ceremony, which has led to its distinctive name. The replica Chair remained at the Flemish Parliament Administration Offices until 8 March. “It has been an honour to attend this event to represent the First Minister and the First World War Centenary Programme Board for the Cymru’n Cofio Wales Remembers 1914 – 1918 Programme.